Clad in bright red zari skirt with a matching blouse, one little girl was playing pallankuzhi (traditional board game with cowrie shells – Picture here) with her best friend T. Having lost her mother within few days of her birth, she became the apple of the eye for her ammamma (maternal grandmother). Little C saw her ammamma sitting in her favorite teak-wood easy chair cracking pakku (bettel nuts) and little did she know that her grandmother was thinking about getting her adorable grand daughter married soon. As this little girl chatted and laughed with her playmate, her ammamma walked towards her and announced her marriage with their relative living across the street. Small pearls of tears rolled down her dark skinned cheek as she heard the news and she bluntly said that she will not get married now. Tears and shouting and pleadings – nothing worked. The date was fixed and preparations for the wedding had began in full swing. She was dressed in her mother’s precious diamonds, ruby, emeralds and gold, her ammamma bought the most expensive silk saree in the town and hired the best nadaswaram group from Pandanaloor, musical town in the Thanjavur district for the wedding. With in a month her wedding day had arrived and she was about to marry a 17 year old teenage boy. As she was brought to the mandap, this 14 -year old young bride looked pretty in her shiny silk saree. Her coal painted black eyes beamed with anxiety as she waved at her friends sitting down the aisle and subtly flaunted her jewelry and mehendi to them. Her aunt stared back with her large eyes and ordered her to walk like a shy bride. She sat on the wooden plank decorated with maa-kollam (rice flour paintings), next to her to-be husband who was also her playmate till yesterday. Her thai mama (maternal uncle) prayed to almighty and adorned her with a rose garland. As the wedding ceremony began with chanting the Sanskrit slokas, she started to pluck each petal of the rose and started to munch it and also offered it to her to-be-husband. Her ammamma pinched her shoulders asking her to stay quiet till the rituals end. Within an hour, that teenage boy tied the sacred yellow thread around her neck and she became a married woman at 14 years of age. And that young bride was my achi. I had heard this story millions of times and I would feel as if l witnessed the celebration myself. Every time she would describe her wedding day, she would boast about the elaborate foods, the talk of the town decorations, the expensive jewelries, the fireworks and the thoughtful return gifts, her side of the family had organized for her. For this strong willed cancer survivor, her husband is her pillar of strength. Having married her most trusted ally, this man is more a loyal companion than a husband to her. They just celebrated little more than 50 years of marriage. Despite the high blood pressure and high blood sugar, her craving for rich food (high in sugar and oil) hasn’t stopped. 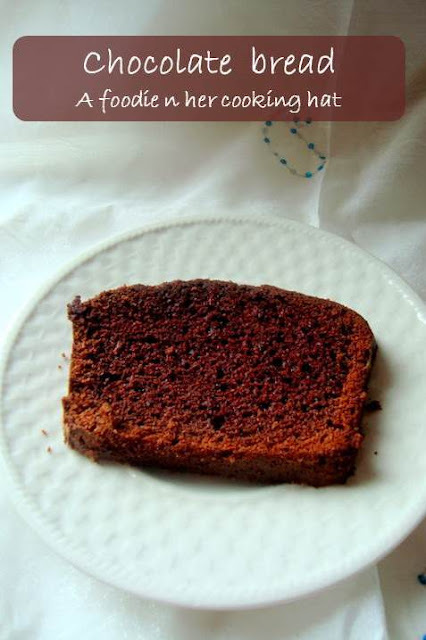 Just to tempt her, I am baking a chocolate bread on her birthday (April 3rd). Her self-confidence and go-getter attitude is something I look up to. She may not even know that I have been influenced by her and on her 75th birthday, I want to let her know that she is loved and her life has a great meaning. Happy 75th Birthday achi ! Hugs. I am celebrating her birthday with Ann’s chocolate bread. I warmed the bread and served it with vanilla ice cream and roasted hazelnuts. Delicioso! I am dedicating this cake also for my ammamma and S’s ammamma’s who are celebrating their 80th birthday this year. 1. Preheat the oven to 400 F. Line a baking dish with parchment paper and set aside. 2. Sift all purpose flour, Cocoa powder & Baking powder for 3- 4 times. This will mix all the dry ingredients together and leave it aerated and without lumps. 3. In a large mixing bowl, beat the butter to a soft and creamy consistency. Add powdered sugar and beat again, until butter and sugar is mixed well. Scrape down the sides using spatula and mix well. 4. Add the eggs one at a time. Beating for about 1 min for each egg at med-high speed. Scrape down the sides using spatula in between. 5. Add yogurt and milk and beat for a minute or two. 6. Now using a silicon/ wooden spatula or a beater at its lowest speed, add the dry ingredients little by little and mix. Do not over beat it, but make sure dry ingredients are wet and incorporated well. Pour this into the prepared dish. 7. Bake at 400F for 5min in the middle rack. Then bring down the temperature to 350 F and bake for 45 – 55min till a skewer put in comes out clean. 1. Maintain all the ingredients at room temperature. 2. Do not open the oven door during first half hour, this could fluctuate the temperature inside and may not make the cake rise. 3. If the batter is poured into a more wider baking pan, or more than one, the baking time will be lesser, like about 30-40min. 4. For those who likes the cake to be little bitter sweet, reduce the sugar to about 1 1/2 cups. Happy Birthday to your Aachi.What an amazing write up. Her story is an inspiration to all. what a touching and a beautiful story of your achi..so nice of you to write a post on her birthday..lovely gesture..
WISHING Aachi a Happy Birthday… loved ur bread cake…bookmarked!!! Happy birthday to ur grandma, chocolate bread looks stunning and very addictive.. Your Achi seems like an amazing woman! Your write-up about her was so touching. Love the chocolate bread too. Achi is really nice, Your post brings your love towards her. 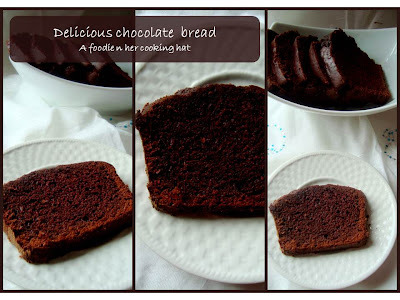 Awesome chocolate bread. such a sweet post.. loved it.. Happy Birthday Achi ! and to both ammamma's..
such a warm welcoming bread for the warm person..
Chocolate bread looks lovely. Happy birthday to your achi, may god bless her with many more wonderful years. Loved reading your post. Keep up your good work.